Def Leppard played the 8th show of the Summer Tour 2013 last night in Skanevik, Norway with another 14 song setlist played. The band played another relatively short set but included the extra second encore of 'Wasted'. They headlined the last night of the Skanveik Blues Festival playing at midnight above Bjorn Berge and Vintage Trouble. 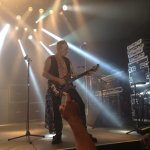 'Gods Of War' was left out of the show after having been played in Uppsala. The rest of the set was unchanged apart from the addition of 'Wasted'. 'Rock Of Ages' and 'Photograph' were played as the first encores as usual. The band played indoors in a tent-like venue on a much smaller stage once again without any videos screens in use or the full lighting rig. The next show takes place on 10th July in Calgary, AB, CANADA.